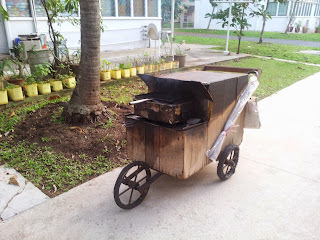 I was searching my family document library 2 days ago, trying to get papers in order for an appeal application for my mother's step-down care subsidy. And my mum being the extremely orderly person she is, has kept everything in place and is a system we still use 7 years later despite her stroke. Having said, I paused to flip through the numerous certificates, courses and accreditation that my mum has had throughout her career right up till her stroke. At first, it was O levels, and then a diploma in IT back when computers barely made it to the scene. My mother was a brilliant typist, scoring an impressive word/minute to qualify a shiny badge for it. She attended even more courses about logistics, learning advanced excel and so on. This was before systems like SAP and Oracle made it to our shores to help companies monitor complex logistics. 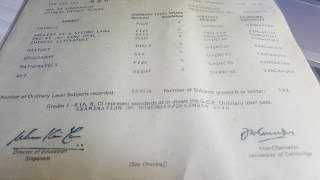 It was easy to pass these off as my mum's poor O Level grades didn't qualify her entry into a tertiary institution due to her poor English marks (she was Chinese educated). It is but of course, that she kept on learning so that she could continue to be relevant. It is a discourse we are familiar with and, with SkillsFuture, institutionalised. However, being a university graduate, a person of middle-class privilege, it is easy to be comfortable in our worldly knowledge. To pass off my mum's pursuits as simply a necessity because she didn't have access to university. It is equally tempting to assume we know it all - and stop learning. A great deal of humility came when I entered the digital media world - where no such course is offered in Singapore, where the playing field is equal, that you feel that your entire educational hardwork seems less useful than when it first felt. My mum must have felt the same when she picked up IT as her profession of choice. I find myself on the same journey as my mother now, learning and developing new skills, taking courses and getting certified for platforms I never knew existed or were possible. Yet, a constant worry plagues me. My mother had to also banked on a particular set of skills - and it was IT. Very soon after the 2000s, a vast majority of consolidation exercises and downsizing caused many to lose their jobs. My mother included - she had to de-skill and work in another field that demanded a strict paycut. The last few years leading to her stroke were the most stressful. Being older now, I am starting to understand her frustrations. Back in 1970s, the government promised developments in the IT manufacturing sector. However that strategy quickly changed when China because cheaper and opened its doors in mid 1990s. We lost our comparative advantage in a heartbeat. Many industries today still grapple with this change. It must have been infuriating to invest so much into one's learning, and not have it pay off in the future you aspire to. I am somehow doubly pained for my mother, who have always shielded me from these worries and allowed me to pursue my passion and strengths. Perhaps if she were healthy now, she would shared more with me. There are two kinds of learning - often dichotomised as incompatible. On one end of the ring, we have the academic approach of meta-knowledge. The abstraction of common phenomenon into concepts that can be adapted to analyse anything - a way of thinking if you will. On the other side presents a realm of practical knowledge that get things done. How to fix a generator on a bulldozer, how to create pivot tables, how to run a training session. The former comes at too high a cost, often econimically and scholastically out of reach from many. The latter is too specialised and can, in my mother's case, be obsolete if the wind changes directions. So what then? While one can certainly, theoretically, keep getting skilled - some boundaries are harder to cross than others. A salesperson selling books can hardly transit into a role that sells medical equipment. This structural unemployment is not simply distilled to just the lack of learning. The person may very be learning all this time, just within their own vertical that no longer exists. It is this insecurity that makes me question the viability of some of the strategies posited by armchair economists, often relegating the structural unemployment as a problem of the lack of self-improvement. But what is clear is that we cannot stop learning, and be closed to the idea that being in a lab analysing cell division is a farfetched idea when you were a geography major. No doubt it comes at a very high cost. However my point is that if we are no longer hungry to learn, we stand no chance at all. This post addresses many parallel and intersecting issues - but the tldr; version is simply this. Just keep swimming, even if it was the wrong direction, we can always turn back, but never stop moving. By the way, my mum wanted to enroll into university to pursue her dreams of getting a degree after I "grew up". She never went on to fulfil that personal aspiration. It doesn't matter because he carries enough knowledge already that universities will be learning more from her experience than what they can offer. Her dream lives on with me, and I will carry that torch of learning forever in my heart.